Wendy Davis, everyone's favorite filibustering politician and Democratic gubernatorial candidate in Texas, wants to expand her support for gun rights in the state by allowing people to openly carry their weapons in public. Davis supports a concept known as "open carry," which would allow people with concealed handgun licenses to carry their guns around in public without having to hide them. 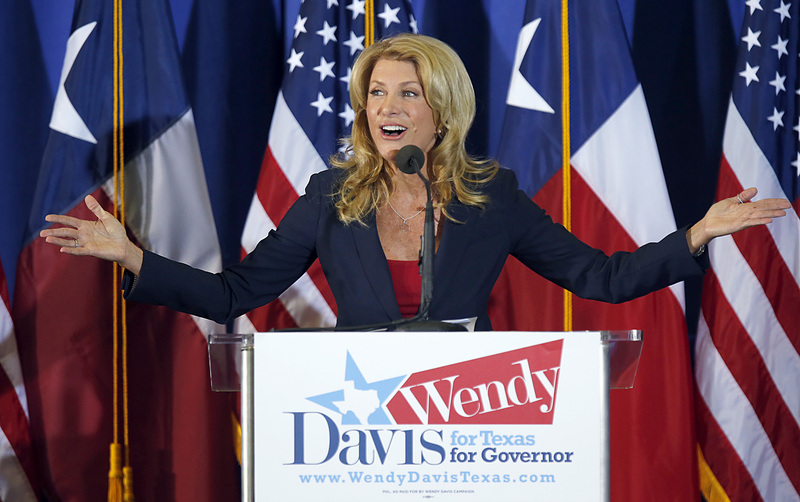 In a state that is known for its gun-loving attitude, even the Democratic Davis has views on firearms that line up with her Republican rival in the race for governor, Texas Attorney General Greg Abbott. The open carry law is a popular issue among gun rights advocates, and one that Abbott already supports. But while Abbott has a concealed handgun license himself, Davis doesn't (though she told the AP that she wants to get one). People can get a license to carry a concealed handgun under current Texas law, and, of course, they can also carry rifles openly, as long as they aren't wielded in a threatening manner. Recent protests at the Texas state capitol have called for less restrictions for gun owners in Texas, which includes the legalization of open carry. Davis, a state senator from Fort Worth, currently has an "F" rating from the National Rifle Association, undoubtedly a mark against her in Texas. But her support for the law is meant for private property owners to decide if weapons can be openly carried on their property. She says she believes background checks and training are necessary to "help ensure that only mentally stable, law-abiding citizens may carry, whether concealed or open." Davis' fellow Democrats are skeptical this is more than political pandering, with Emmanuel Garcia, the spokesman for the Texas Democratic Party, telling AP that there is "little or no public safety justification for open carry." According to the National Conference on State Legislatures, open carry is allowed in 17 states, with other state letting cities and counties decide on restrictions. Texas has around 600,000 concealed handgun license holders. To become a holder, there are training requirements and background checks to undergo, and you also must be over 21. The requirements were relaxed in 2013, with the required time to be spent in the classroom and on shooting range instruction slashed in half, from 10 to 15 hours to four to six hours.